In 2004 Johan Thom started working on a series of performances, installations and multimedia works based on the Greek mythology of the Minotaur. All these works utilized the different elements of the mythology in order to reconsider the various relationships of power that shape our lives in contemporary post-apartheid South Africa. For the Minotaur Series #12 Thom reconsidered the notion of a labyrinth as a complex system of paths, or tunnels, within which it is easy to get lost. Thom considered a labyrinth as being a composite of many layers of knowledge and experience that, if carefully deconstructed, could re-create something like the original ‘master plan’. Of course the master plan acts as both the antidote and the poison (from the Greek concept “pharmakon”) – being simultaneously the plan that lays the foundation for the labyrinth and the map with which to successfully negotiate your way through it. Thus, for the labyrinth to succeed in its purpose, which is always to get us lost within the twists and turns of its skewed logic, its master plan must remain completely secret. However, even then, when it seems so absolutely impervious to our efforts to unravel its secrets, a simple piece of rope may still defeat its purpose. The installation comprises a multi-channel video projections produced by Thom whilst on a CRIC/ Phlosa artist in residency program in Sierre, Switzerland during the period of November 2004 – January 2005. 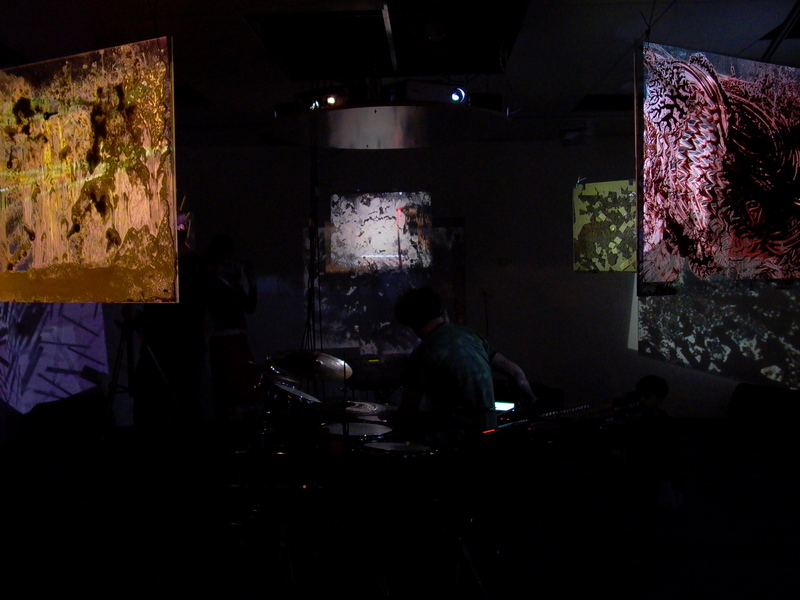 Simply stated it is a 7 channel video projection, shot with 7 individual cameras, and projected onto 7 hanging glass panels. The footage shows a 20minute performance by Johan Thom based on a free mixture of various cultural traditions as well as different elements drawn from his personal iconography and influences. These include, African rituals and ceremonial practices, western performative traditions such as those presupposed by Action painting, Fluxus, the Viennese Actionists and even that of the Yomuri Independent operating in Japan in the late twentieth century, amongst others. Recurring motifs in his work includes the use of rope/ gut, pencils, organic materials including honey, flour, fat and soil, to name but a few. Often he uses these materials as extensions of the body and its movement through space and time, creating performances and objects that resist easy interpretation or even classification as ‘art’. During the production of the Minotaur series #12 Thom was introduced to Christophe Fellay, a renowned experimental Swiss percussionist who specializes in improvisation. In his performances Fellay fuses the use of digital sampling technology with that of traditional percussion to create a seamless interaction between man and machine – often leaving the audience with the impression that they are hearing several musicians play simultaneously. Thom and Fellay expressed a mutual interest in collaborating on the project and decided that Fellay would improvise an in situ response to the sounds and movements of the installation. 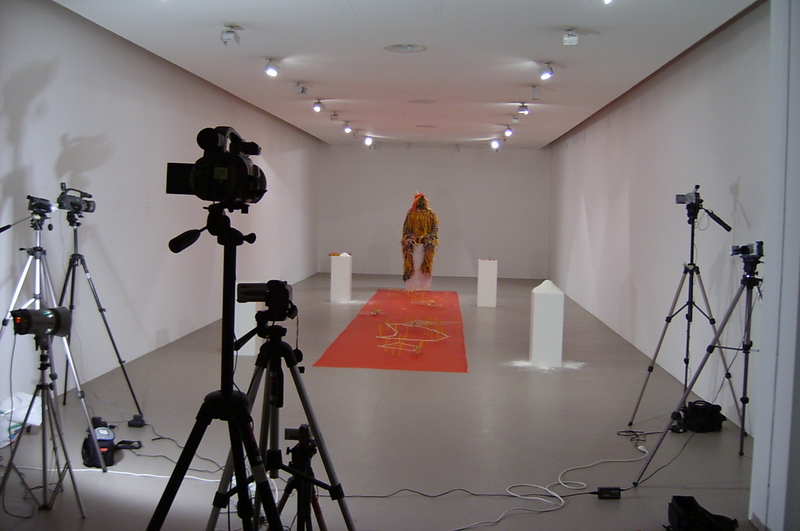 There would be no rehearsals and no double takes: Fellay would draw from his own considerable repertoire of sounds and ideas to enter into direct communication with those presented by the movements and sounds of Thom`s body (shown in the video installation wearing a full-body mask comprised of camouflage material and covered with approximately 2500 pencils). Though the project was previewed at the Forum d`Art Contemporain (FAC) in Sierre Switzerland from the 12-15th of January 2005, the intention was always to show it in South Africa. Khwezi Gule, Curator of Contemporary Collections at the Johannesburg Art Gallery (Jag) invited Thom to show the work from 20 April – 20 June 2006 as the first in a new series of exhibitions at the Project Room. The Minotaur Series 12 was co-produced by the Ecole Cantonale du Art d`Vallais (ECAV) and the Centre de Reflexion Sur l’Image et ses Contextes (CRIC), Sierre, Switzerland. NB: There is a strong relationship between the past and the present in this work, the past, recorded and played back space moves within the present live performance. What do you think about the recording and playing back of a performance and the live performance both, do you feel it had an impact on the work? JT: I tend to believe that every art work has an internal ‘economy’, something like a point of focus where concept and form meet. For this particular work, the interaction between the projections and Christophe Fellay’s live performance was the point where the work begins to function as an experience. Today, many contemporary artists are using projections as part of their work. Perhaps that’s something that comes from installation, in the sense that you create an environment and then, within the space of that environment, you are free to add certain elements (some of which may be live performance/ video/ sound or any other medium for that matter). So for this particular piece I felt like it was a larger environment aimed at creating an experience. On that level I don’t necessarily view it as a performance piece, I view it as an installation that is finished only when the live performer (Christophe Fellay) completes it. NB: Do you feel that your projected performance has a similar effect or a completely different effect to your live performances. Do you feel there is a connection between them? JT: There are small connections, but I don’t feel like the projected sequences fit comfortably into the frame of performance art: I treated each sequence much like a film sequence. When you think about the kind of logistics that are required to shoot sequences with seven cameras, then the work is closer to a film based model of artistic practice and expression, one where you have to plan scenes carefully, shoot and reshoot them, edit and go through the whole process of grading etc. So no, I do not feel that the projected elements can be classified as performance. 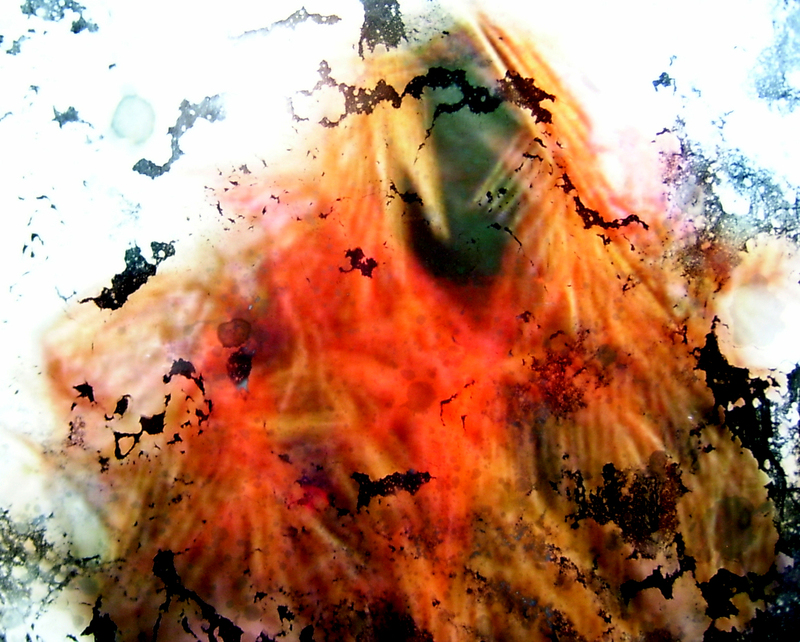 It was a video work, and I think that’s quite important to me. I don’t mix up performance and video easily and if and when I do it has to be a process that is central to the concept of the work. I know that people think that performance is a bi-word for any performative aspect of artistic practice, but ‘performance’ and ‘performative’ are not mutually inclusive concepts. Performance is a discipline that operates within certain conceptual and formal limits and documenting performance changes it completely (if that documentation becomes the artwork as a photograph, for example). NB: The circular form meant that the viewers could not see all of the glass projections at once; they had to interact, and turn their bodies to follow the movement across the screens. This viewer interaction could be seen as a performance in itself. Did you think about the viewer in this space, and how they would interact? JT: It was quite important to me that the viewer felt compelled to move, to constantly look around and see how this figure moves around the space. In terms of a circular format, other people have suggested that I could have used other formats as well: I could have activated the space by placing the different projectors (still in the sequence) but across other, or through other, formal arrangements in the space, arrangements which would accomplished the same thing, more or less. What was interesting to me was that if the viewer stood in the center of the space, which I think would be the normal response for the viewer, then they would have to turn around, and sometimes the figure would run behind them, for example. The viewer would be slightly disorientated and feel that they themselves might be stalked by the figure, depending whether they were moving or standing still. NB: I read about your labyrinth concept in this work. How do you see the audience experiencing this labyrinth? I felt myself trying to track your performance on the screens, to understand your rituals and movements, and move my body around the circle of screens. Was this your intention? JT: Absolutely, it was really part of the work to recreate this kind of a labyrinth, to create a sensory confusion, of ‘looking at’ but also of feeling confused and lost (even though, for all purposes and intents, you could remain stationary and just turn around trying to follow the figure). I don’t think it’s a kind of baroque expansion I was looking for, but rather some introspective personal space (of course in hindsight it’s quite funny if you look at the amount of elements that it took to create that introspective space). Basically what I was trying to do was create a space where the viewer would literally feel that they were physically and mentally inside the work and vice versa – paradoxically, I was assaulting their senses with an overload of sound, movement etc in order for them to turn inwards (emotionally and mentally). NB: The temporary nature of this kind of installation, that it was only complete and fully realized for two sessions of 20 minutes each while Christophe Fellay was playing, is interesting to me. Do you feel this element of time enhances the work, or is problematic for the way the piece is viewed? JT: It depends on how you look at it. For me, it enhances the work because people who go there and see the performance know that they have seen something that they may speak about afterward, but they will probably not see again. The nature of Christophe’s performance as an immediate, in situ response to the movements and sounds of the projections, means that whenever you see the work it will be completely different (and that’s is different from saying, ‘yes, all works are different when you install them in different spaces’). My experience of the work has varied according to how Christophe has interacted with it, from playing very soft and gentle to being quite violent and loud. So for me it was really interesting, because it offers you something that you will not see again, an experience that exists only in that moment in time. But it also means that no-one can really buy the piece or preserve it for prosperities sake. NB: What were your concerns behind putting the screens in a circle? I was aware of the other people in the space as well as the installation and performance, and this changed my reaction to the experience. Were you aware of the effect this would have on the audience, a body of people standing in a circle who could see each other? JT: Well I was hoping that people would actually move through the space while Christoph was playing, but I think that the general attitude that people have is that when a performance happens we sit and look, we watch, and for me that’s quite a pity. But I think it also had to do with the ergonomics of the exhibition space itself and the kind of general attitude to – and history of – performance art in South Africa. Without becoming embroiled in a major debate I will just say that the local art-going audiences, galleries, museums and the public in general still need to be challenged more… we need more artists like Steven Cohen to disturb their comfort zones, implicate them and to challenge the relationship of power implicit in the viewer/ artwork relationship. So yes, in that sense I was really hoping that people would move more, not just sit down and become impassive spectators. For me it was quite a pity that more people didn’t just walk around while the performance was happening (but perhaps the exhibition space was also just to small to allow it). Fortunately some people did move around but in general I can honestly say that at the preview of the work in Switzerland everybody moved around constantly… and there we had a smaller space. You can’t really plan for what the audience will or will not do.